Thematic Fine Art Prints ©2004 is a supplemental fine art program that will use existing resources from Art Connections ©2001 and The National Museum of Women in the Arts Collection ©1998 to create 30 fine art cross-curricular packages based on Open Court Reading themes. The packages can be used with the Open Court Reading program or can be used by non Open Court Reading customers to support general classroom themes. Each thematic package is directly correlated to Open Court Reading, making it easy for Open Court Reading teachers to expand their lessons using the fine art and cross-curricular suggestions provided. The wide selection of themes makes the program flexible enough to work in any classroom, with any subject. Writing prompts can be used to provide extra writing practice or “inspiration” during regular writing and language arts instruction. 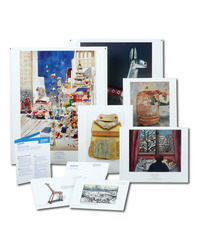 A wealth of information on the artists, artworks, media, and activities are presented in a concise, easy-to-use format, so the teacher can incorporate them into a lesson with no fuss. Literature Connections Each package lists thematically related books from the OCR Classroom Library, making it easy for teachers to incorporate literature into their lesson plans. Teachers can link to SRAonline for art production and activities lessons for each theme.